Two Temple Place is one of London’s finest hidden architectural gems. Completed in 1895, this stunning house was built for William Waldorf Astor as his London Estate office. A beautiful late-Victorian architectural hybrid, the house combines the grandeur of a London mansion with the intimacy of a private home. The interiors are adorned with mahogany, marble and stained glass and create an opulent yet intimate setting for any event. With a variety of stunning rooms, exclusive hire of the house enables you to create a truly unique experience for your guests. Standing majestically at the centre of the house is the grand oak and mahogany staircase adorned with literary and historical carvings, creating an ornamental centrepiece for events. Two Temple Place offers fantastic flexibility for events across three main event spaces and several additional smaller rooms. The Lower Gallery is perfect for standing receptions and dancing for 150 guests. On the first floor Astor’s former private Library is small and charming and perfect for an intimate drinks reception. 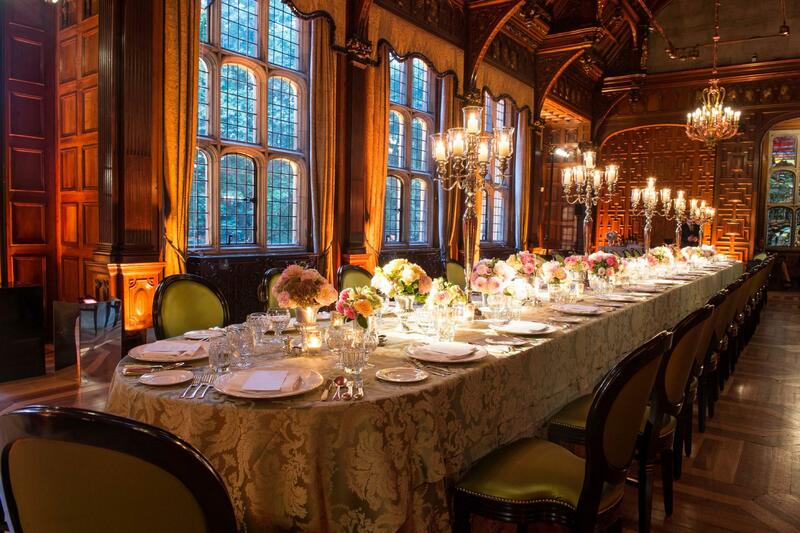 The Great Hall, with its majestic hammer beam ceiling and stunning stained glass windows provides an exquisite setting for any high profile dinner, seating up to 120 guests. Two Temple Place is the perfect destination for a large variety of events such as corporate dinners, charity receptions, filming, concerts and private celebrations. All three main spaces are licenced for wedding ceremonies which gives couples maximum flexibility when planning their special day.